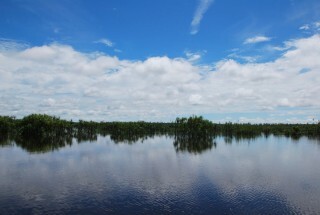 The Katingan Project is an endeavor to protect and restore a 200,000 ha peat swamp forest in Indonesian Borneo. The Katingan Peatland Restoration and Conservation Project (the Katingan Project) aims to reduce carbon emissions, protect biodiversity and create sustainable economic development opportunities that improve the lives of rural communities. The Katingan Project is based on the premise that large areas of peat swamp forest in Indonesian Borneo can still be saved or restored, thus offering local people sustainable sources of income, tackling global climate change, and doing it all based on a solid business model. What defines them is a no-nonsense, transparent and result-oriented approach to land-use and conservation in a part of the world where this is needed most. At its core, the project is financed by what it achieves in terms of sequestering and avoiding the emissions of carbon dioxide. This part of the project is managed by an Indonesian company, P.T. Rimba Makmur Utama, through an Ecosystem Restoration Concession granted by the Indonesian Ministry of Forestry. This core business model works such that the benefits are passed on to local communities, the local region and the wider State of Indonesia in which it operates.